AFTER a long wait, a national football league is finally unfolding the Philippines. 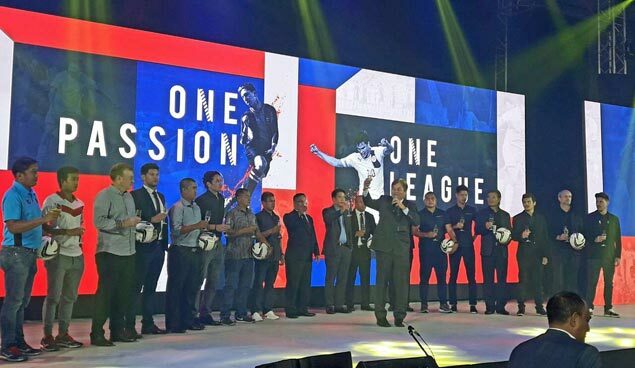 The Philippines Football League made a quite luxurious launch on Friday night in front of all stakeholders at the Shangri-La Fort Grand Ballroom. “This is truly an unprecedented endeavor,” said PFL secretary-general Edwin Gastanes. “We are looking forward to a vibrant and exciting first season ahead for the PFL." There will be eight clubs batlting in a two-round home and away elimination format, bringing games closer to the fans. Batlting for honors are Global-Cebu FC, Ceres-Negros FC, Kaya FC Makati, FC Meralco Manila, Stallion Laguna FC, JPV Marikina FC, Ilocos United FC and Davao Aguilas FC. “We are bringing the passion and the love for the Beautiful Game to different parts of the country with the PFL,” said Philippine Football Federation president Mariano “Nonong” Araneta. “This is a dream come true for all of us involved in this project. We appreciate the time, effort and resources put in by the clubs to make the PFL possible. We’ve taken the next step for Philippine football." The tournament officially kicks off on May 6 with Kaya Makati F.C. facing Ceres Negros FC at the University of Makati at 4 p.m. followed by the tussle between Stallion Laguna FC and FC Meralco Manila in Binan at 7 p.m.
Ilocos United FC will make its debut on May 7 as it hosts the Davao Aguilas FC, while JPV Marikina takes on Global Cebu FC at the Marikina Sports Complex at 7 p.m.